Cut the bread into sandwich sized portions. Slice each horizontally. Use a fork to mash the thyme into the cheese. If the cheese is very crumbly or cold, let it warm up slightly (closer to room temperature) and then mash. Spread on the top half of the crusty bread. Top the bottom half with a single layer of peaches. Repeat for remaining ingredients. Close the sandwiches. Heat the panini press to medium and press until the cheese is soft and the sandwich is hot. I like my panini press because it can make thin or thick sandwiches. As you can tell my tastes generally run towards the crusty bread, big flavored filling variety. I think it is because I am not really a sandwich person. If I am going to eat a sandwich, I want to eat a sandwich. As a child my mom would pack my lunch* and it rarely included a sandwich. I didn't like kiddy staples like peanut butter and jelly and loathed soggy bread so more often than not, it would be tuna salad and crackers (packed separately, natch) or pasta salad or vegetable crackers and cream cheese or a mixture of things like a deviled egg, raw celery (packed in water to keep it crisp!) and dip and some fruit. Rarely was it as something as plebeian as a sandwich and on the rare times it was, all of the ingredients were packed separately for assemble at lunch to insure no bread sogging. So it really wasn't until I was adult and quite possibly over the age of 25 I embraced the sandwich at all. Our local Italian deli has a wonderful sandwich that made me reconsider my no sandwich stance at least a bit. 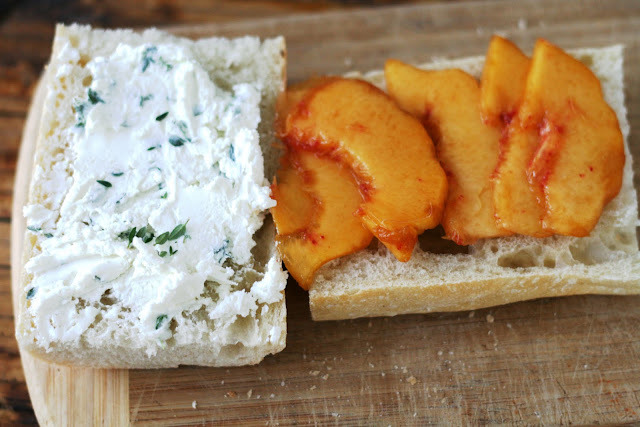 This sandwich is delicious because it makes the most of in season peaches by now overwhelming them with competing flavors. 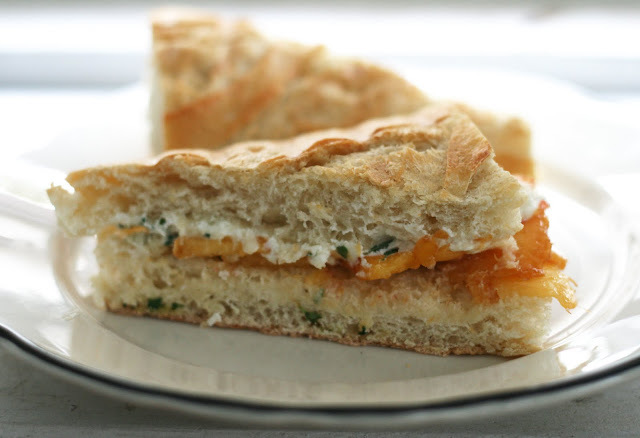 The goat cheese is mild and the thyme, while present, doesn't overpower, it just keeps the sandwich on the savory side rather than letting it drift into dessert territory. *She loves packing lunches. I think she'd still pack mine today if I wasn't married and living in my own home. I am 99.9% sure she still packs my brother's lunch and he is 25 and in grad school.